Help me pin down what the fonts are that are used for each album's title (and tracklist), would ya? I don't know about Surrender / Exit / Dig liner notes fonts. They've got forums where people sit around and identify them and you'd have good luck there! Whacha working on if you don't mind me asking? Awesome! Thank you. Vitesse is very yummy. I was just staring lovingly at the back of Come With Us and decided I wanted to build my collection of Chemical fonts. I don't think it is actually. It's more rounded. Like somewhere between Andale Mono and Spot Mono. For Exit Planet Dust the condensed/compressed font is "Helvetica LT Std Ultra Compressed. Think we're all done now. It's almost there, Toxic! Ask them if they could customize it for you by putting their signature "S" at the end and replace their "k" with a "p"! The closest match I've found for the 'No Geography' title is Mittelschrift Austria D, but it's not exactly the same. On the cover the edges are rounded and the a is not the same as in the Mittelschrift font. It's super close though. Also, Mittelschrift is designed by URW. The same folks behind Clarendon, used for Surrender, and Egyptienne, used for Come With Us. I'm still digging, but that's as close as I've got so far. It is so, so, so close to GT Pressura Mono. Huge thanks to Identifont's "search for fonts similar" feature. Except for the lowercase r. On the cover, the r curves down at the end, in GT Pressura Mono the r stops short horizontally. Right!? I don't see why they would edit just one letter like that. We could possibly just use the lowercase r from Typewriter Gothic, and GT Pressura Mono for all the other characters... such a bother. And make it bold or add a stroke to get it the same weight. I say just stick with the slightly more complete 'r'! I fully endorse this font on a Chemical work. Update: it actually is GT Pressura Mono Regular exactly 100%. 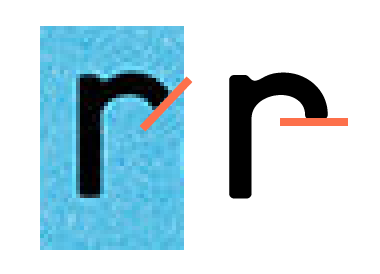 The 'r' is still shorter. It's only by a little, but it's definitely been cut off a little. So I'm sticking with 99% GT Pressura Mono! What font is the one used on the back and posters? Is it available to download? Thanks!